It is with great sadness we record that Mike Preston died aged sixty-seven in the Leicester Hospice on 18th August following a three month battle with cancer. Mike will be best known to Auster Club members as the leading light behind the Club’s Heritage Group, formed to collect remaining oral and documentary history of the marque and to forward permanent display in Leicestershire’s museums. His driving force secured a lottery ‘Awards for All’ grant, equipment was bought, interviews done and material collected, and with the help of Mick Ames, Ian Pawson and a small committee, the original IAC website was set up. Material appeared in the ‘News’ and later in book form as ‘Austers – Nearly All You Wanted To Know’. This was followed by the very much expanded third edition of Ambrose Hitchman’s ‘The History of the Auster Aeroplane’, and the collection of recordings was formally presented to the County Heritage Services at the IAC AGM at Leicester in 2003. His earliest action on the display front was the restoration of J1N King’s Cup winner G-AJRH by Ron Neal’s RN Aviation in 1998/9. This is a key exhibit in the Charnwood Museum at Loughborough. Mike as a County Councillor in direct discussion with Heather Broughton, Head of Heritage Services, managed to magic up money for this. Following on, with the Heritage Group formally constituted in 2000, Mike pushed forward the addition of J1 prototype G-AGOHto Mk9 XP280 suspended at Snibston Discovery Park, Coalville, together with the comprehensive accompanying display. This is now a permanent memorial to Mike’s belief in not letting the Auster fade into history. Although Mike had entered aviation as an Auster apprentice after the demise of Beagle, he had worked for Fields and even on such important projects as the toilets in Concorde! He moved on into lecturing in engineering at Trent Polytechnic, Nottingham, and then at Loughborough University where he became professor. 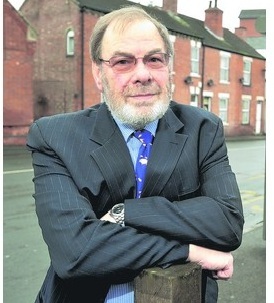 He entered politics as a Conservative and held office in Charnwood Borough Council and the County Council. He was leader of Charnwood when his illness struck. Mike was a native of Ratcliffe, the Leicestershire village where the first Taylorcraft flew from Lindsey Everard’s airfield in 1939. Indeed he was still living in the much expanded bungalow in which he had been born. He was buried in the village after a packed Thanksgiving Service in nearby St Mary’s Church, Queniborough (its spire pokes above the ridge in many photographs across Rearsby Airfield). The impressive gathering was a testament to Mike’s wide connections and the esteem in which he was held. Our thoughts are very much with his wife Beryl who will find life somewhat quieter. No doubt Mike will also be missed by the dogs and cats he loved, as pictured in a sleeping heap with him in the Order of Service. Humorous to the end! stripped in the workshop, a lasting tribute to Mike Preston’s efforts. A video taken at the time can be viewed here.